Market economy status for China and European participation in China’s ambitious One Belt One Road project are expected to be the highlights of the China-EU bilateral summit that began in Beijing on Tuesday. Chinese President Xi Jinping met visiting European Council President Donald Tusk and European Commission President Jean-Claude Juncker on Tuesday. 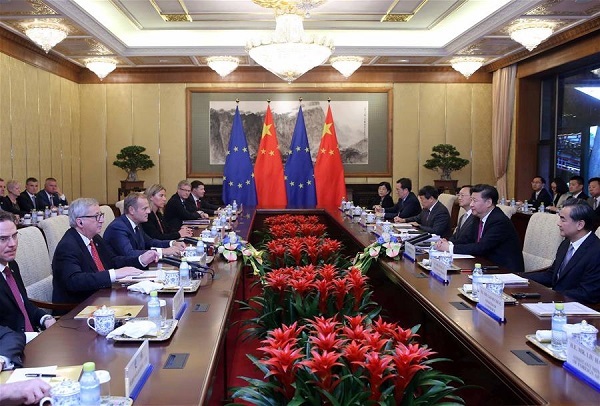 Xi referred to both the Silk Road and the EU Commission’s impending decision on market economy status for China during talks with the European leaders. “China hopes the EU will carry out its obligations on Article 15 of the protocol on China’s accession to the WTO as scheduled,” Xi said. Under the agreement that led China to join the World Trade Organization in 2001, WTO members pledged to scrap in December 2016 a shortcut for applying a non-market economy standard in calculating anti-dumping duties on China. Whether the EU should recognize China as a market economy is a politically-charged debate within the 28-member bloc. The issue has become a flashpoint in Europe as a sluggish EU economy, excess Chinese production capacity and a struggling European steel industry spark fears of a manufacturing decline and further job losses from the UK to Italy. Britain’s vote to exit from the EU was also discussed during the summit on Monday where both sides reiterated that Brexit won’t affect China-EU ties. 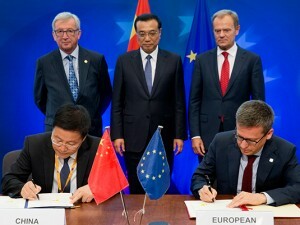 Earlier on Tuesday, Premier Li Keqiang co-chaired the 18th China-EU summit with the two EU leaders, Tusk and Juncker. On Wednesday, Chinese Premier Li, speaking at an EU-China business summit, said Beijing will ensure a level-playing field for foreign companies operating in China. On Monday, European Trade Commissioner Cecilia Malmström, during a keynote speech at University of International Business and Economy, highlighted the benefits of the trade and investment relationship between the EU and China. “China’s development has created a vast new economic frontier for European firms, as exporters and investors. Our exports here alone support over 3 million jobs in the EU,” said Malmstrom. Beijing wants to ensure EU capitals are on board it’s ambitious Silk Road project. China has already invested billions of euros in the EU and is expected to announce a further investment of two billion euros in the European Union’s new infrastructure fund. Earlier last year, China’s President Xi Jinping said he hoped its annual trade with the countries involved in Beijing’s plan to create a modern Silk Road would surpass $2.5 trillion in a decade. Under the so-called “One Belt, One Road” initiative, China aims to create a modern Silk Road Economic Belt and a 21st Century Maritime Silk Road to boost trade and extend its global influence.